Posted September 2, 2013 by laurielmorrison & filed under Middle Grade Literature, Series on creating engagingly fallible narrators, The Writing Process, Young Adult Literature. Welcome back to my series of posts about how to create an engagingly fallible first-person narrator! Last week I defined fallible narrators and offered one strategy for helping readers recognize an engaging narrator’s fallibility: incorporating narrative distance. Today I’ll move on to another effective technique: setting up an audience and purpose for a first-person narrator’s account. In her excellent book Reading Like a Writer: A Guide for People Who Love Books and for Those Who Want to Write Them, Francine Prose admits that she “tricked” herself into writing her first novel and her first published short story by writing what she calls “framed” narratives: stories within stories that one character tells another character as the reader “eavesdrops” (85). According to Prose, this strategy worked because it helped her figure out the answers to some important questions: “Who is listening? On what occasion is the story being told, and why?” (85). The answers to these questions are important, according to Prose, because they determine the voice and tone of the narrative and they suggest which details the writer should linger on and which details don’t belong. In addition, I would add that when writers specify a narrator’s audience and his purpose for telling a story, we give young readers tools to evaluate how honest the narrator is being—both with himself and his listener—and what important information he might be leaving out. When I came home from that church I was angry at the lies being told. Not just that they told that Bix was bad and a runaway—because there was some bad growing in Bix, and he did run away and that is that. But those people did not understand worth a penny. From the start, readers know that Jerome is angry with Bix’s stepfather and the other people who do “not understand worth a penny.” His anger and his determination to prove those people wrong shape his voice and influence what he includes in his story. In an article about the irony of first-person narrators in YA fiction (which I referenced a couple of posts ago), scholar Mike Cadden discusses this novel and points out that young readers might not realize that Jerome doesn’t seem to tell the whole story of what happened with Bix. 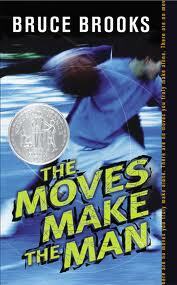 But I’ve had seventh grade students read The Moves Make the Man, and they haven’t just taken Jerome’s words at face value; they’ve understood that he exaggerates his own strengths and might not share every detail. I think this clearly stated purpose at the beginning of the novel helps young readers to look out for the gaps and exaggerations in Jerome’s account. This passage hints that Robbie has a clear audience in mind for his story, so readers are left wondering, if only on a subconscious level, to whom Robbie addresses the story, why he feels motivated to tell it, and how his audience and purpose influence what he shares and what he leaves out. Also, the direct address and halting sentences in this passage show how difficult it is for Robbie to tell his story. Robbie often seems very sure of himself, but Paterson uses direct address to reveal that he’s not as together as he’d like to be. I am playing around with the strategy of specifying an audience and purpose in the project I’m working on now. I’m doing this partly so that readers can understand more about my sometimes-prickly protagonist’s feelings than she is able to admit; partly because one of my VCFA advisors, Franny Billingsley, pointed out that invoking an audience can add to the sense of urgency in a story; and partly because I wanted to make sure that this first-person narrator sounds different from the narrator in the other book I’ve been working on. This technique brings with it its own challenges, and, like the strategy of using narrative distance, it’s sort of a macro-strategy. If you want to use a narrator who’s looking back from a distance on the events of the story or addressing a specific audience, you probably need to decide that early on because those choices will shape a lot of what you write. In the next posts, I’ll address some micro-level techniques you can use at any point in the writing process. Brooks, Bruce. The Moves Make the Man. 1984. New York: HarperTrophy, 2003. Print. Cadden, Mike. “The Irony of Narration in the Young Adult Novel.” Children’s Literature Association Quarterly 25.3 (2000): 146-154. Project MUSE. Web. 28 July 2011. Paterson, Katherine. 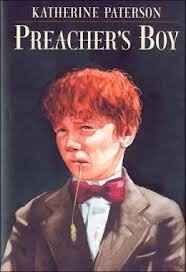 Preacher’s Boy. New York: Clarion Books, 1999. Print. Prose, Francine. 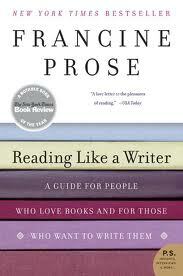 Reading Like a Writer: A Guide for People Who Love Books and for Those Who Want to Write Them. New York, N.Y: Harper Perennial, 2007. Print. Great post. This seems to be the technique of THE TRUE MEANING OF SMEKDAY, where the main character is writing essays. I started to do this with a short story, but I think I need to expand that story into a novel. I always wondered about first-person stories like THE IRON KING by Julie Kagawa where the main character introduces himself or herself to the reader as if he or she was talking to the reader. Perhaps that’s part of the strategy of announcing a purpose.